I like my iPad and I LOVE the new Talking Mats app. My 89 year old mum lives on her own about 2 hours from where I live and enjoys looking at photos on my iPad Mum has ‘all her marbles’, as the saying goes, and freely expresses her extreme views on current affairs, politics and photographs in Hello magazine! More difficult however, is discussing her failing energy levels and physical strength. She has till now resisted all suggestions of moving house to somewhere with more support. The reality is she isn’t managing, she’s struggling. 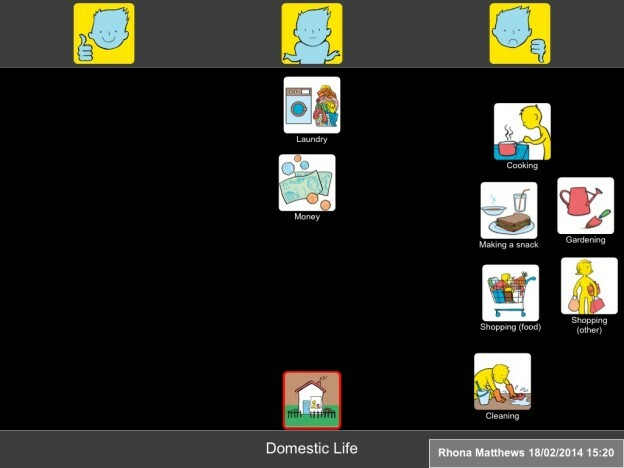 For the first time using the Talking Mats app she confessed to all domestic tasks being difficult even with the bits and pieces of help going in regularly. The app made that bit easy. Making a decision about the next step will be more difficult. This entry was posted in App, Blog, Digital Talking Mats, Participation, Personalisation, Self directed care and tagged App, Participation, Self directed care, Talking Mats on March 10, 2014 by Guest Blogger.